The second of the state legislature’s two former leaders has now been convicted on multiple corruption charges, after a jury lost no time in finding former Senate Leader Dean Skelos and son Adam guilty on all eight counts. Dean Skelos and his son Adam were found guilty of charges including extortion and bribery, after prosecutors said they schemed to use the former Senate Leader’s influence with the real estate industry to obtain no show jobs for his son. 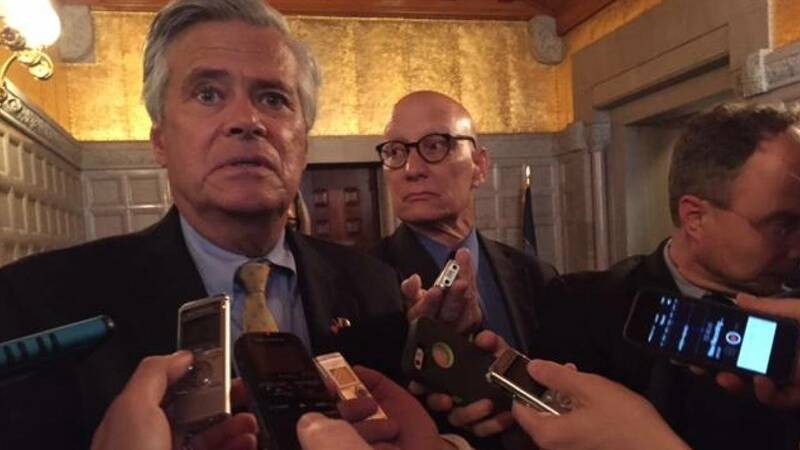 With the conviction, Skelos automatically loses his seat in the Senate. The jury deliberated for less than a day. Susan Lerner, with the reform group Common Cause, says that’s telling. Former Assembly Speaker Sheldon Silver was found guilty on numerous corruption charges in late November. Lerner, with Common Cause, says she hopes the convictions will spur changes, including limiting or banning outside income for lawmakers. The private employment of both former leaders factored heavily in the cases against them. But, after the Silver conviction, Governor Cuomo said he did not see much interest in the state legislature for switching to a full time body with strict limits on outside pay. Following the Skelos verdict, Cuomo, in a statement, said the convictions are a “wakeup call” to the legislature to stop stalling, and the governor says he will put reform on his agenda for the New Year. Karen Scharff, with Citizen Action, says she knows change won’t be easy, but she says the small tweaks on ethics that lawmakers have made in the past few years, just won’t cut it anymore. “Any legislator who won’t back top to bottom, full scale reform to stop the corrupting influence of billionaires should get slap back from voters on Election Day,” Scharff said. A special election to replace Silver and Skelos is likely to be held on the Presidential primary day next April. In a statement, the current Senate Leader, John Flanagan who, like Skelos, is a republican said he is “deeply saddened” by the verdict. Flanagan vowed to work to “restore the public trust”, but did not offer specific steps. Incriminating audio tapes, obtained through federal wiretaps, played a key role in the case against Dean and Adam Skelos. Including an exchange where the two lament Governor Cuomo’s decision to ban hydro fracking, after the former Senator arranged for a job for his son at an environmental engineering firm that would have benefited from the natural gas drilling process. The senior Skelos vows to challenge Cuomo in an election. Defense lawyers said that the former Senate leader was simply trying to help his son, and did nothing illegal. But in the end, the jury didn’t buy it. The Skeloses face a maximum sentence of decades in prison. They plan to appeal .